Let’s face it: most videogames have terrible morals. While there are many genres spanning a wide variety of gameplay types and styles, for the most part, the medium is plagued by violence and antisocial in-game choices that indulge and bring out the worst in us. Nowhere is that more apparent than in Graveyard Keeper, a property management sim that puts a ghoulish spin on Stardew Valley. Most of its more gruesome details are easily missed if you don’t think about them too hard—but not thinking too hard has never been what I’m about. When you consider the specifics of some of the finer points of the game, a lot of horrifying logistics emerge. Here are but a few of the things that make Graveyard Keeper even more messed up than it initially appears. One of the core parts of Graveyard Keeper is also a very deep-cutting comment on the Catholic church and how religion is used to make money and establish order. The whole point of the game is to maintain such a nice graveyard and church that you gain more members, earn more tithes, and have enough cash to throw around to purchase fancy titles to reflect your status. It makes no secret of the reality that many religious figures preach “prosperity gospel” and manipulate the sincerity of their followers in order to live a cushy life. Now, we all know that the Christian church can be more interested in accumulating wealth and punishing nonbelievers than actually helping anybody. But still, it’s terrible, in a fascinating way, to see that turned into a system, one that, as a former pastor’s daughter, I can easily wrap my head around. I especially like that you can “craft” different sermons and then deliver them depending on what your particular needs are at the time. It’s deliciously cynical and sarcastic, but in practice it feels absolutely disgusting. 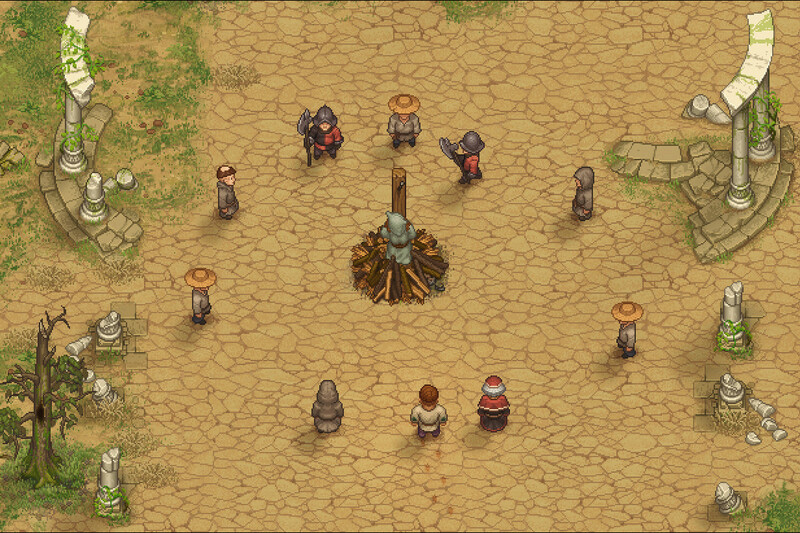 Of all the bad things I’ve done in videogames, burning a bunch of witches doesn’t necessarily rank all that high. After all, who could forget “No Russian” from Call of Duty: Modern Warfare 2, or the white phosphorus from Spec Ops: The Line? That being said, the casualness with which the graveyard keeper and the Inquisitor discuss collecting and burning more witches, and how this will bring in more members and profit for the church, is chilling, especially given how it mirrors the historical reality of female persecution. That, as well as the game’s flippant dismissal and moral ambivalence towards the Inquisition, sends shivers down my spine. As the Prior of the church, you are tasked with collecting the corpses dumped in front of your morgue every few days and burying them in the yard. Of course, after a time, you’re going to start running out of room for your grave sites, and many bodies will be too deteriorated or dissected to provide much of a score. But no worries! If you have corpses accumulating and nowhere to put them, you can just dump them in the river and let them drift downstream to The Town. I haven’t gotten far enough in the game to see if doing so has consequences (early builds of the game kept track of the bodies, so I suspect it does), but I imagine they start to pile up and make a fun little cadaver dam after awhile. Maybe they even start to pollute and poison the water, killing more people and starting the profitable cycle of death anew! There’s so many horrifying possibilities to choose from. It’s bad enough that as the graveyard keeper you can extract organs, bones and other parts from each of the corpses delivered to your estate in order to get a higher score. Especially grim, however, is exactly how some of these parts can be used, particularly the skin and fat, which can be used to make paper and candles, respectively. Imagine lighting a holy candle in the sanctuary of the church, only to remember that time a few short weeks ago when it was still but a lump of tallow on an unsuspecting cadaver. Ed Gein would be proud. And if you thought making potions and materials from dead human beings promotes a revolting lack of respect for human life, wait til you get a taste of flesh! From the first few minutes of Graveyard Keeper, you can slice up the tissue you extract from cadavers at the cutting board in your cottage and eat it for an energy boost. Later in the game, however, you can also use a Royal stamp to mislabel the meat and serve it to other (unsuspecting) people, transforming your town title of “Prior and Graveyard Keeper” to “Soylent Green Chef Extraordinaire”. From illegal dumping, improper burials, dissection and mutilation of a corpse, and literally eating people, truly, there is no wrong way to desecrate a body in Graveyard Keeper.